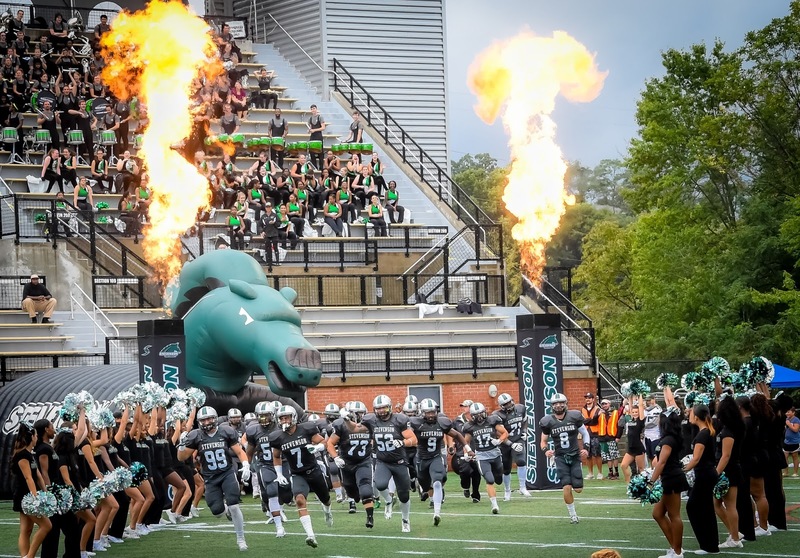 MAC Football News: Mr. MAC - My Week 8 Results Explained "Ouch!" Mr. MAC - My Week 8 Results Explained "Ouch!" 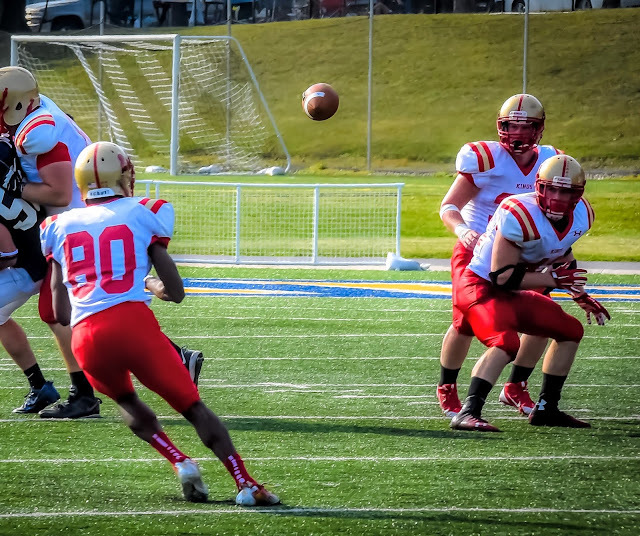 Wilkes played well for three quarters Saturday, but the Dutchman's depth wore the Colonels down in the fourth quarter. Wilkes was down just one touchdown at halftime. They were behind ten points after the third quarter, but then Lebanon Valley closed the deal with a barrage of scoring. Throw in a Corey Keen 22 yard pass reception from Dutchman quarterback Tim Pirrone that capped off a nine play 72 yard drive. Then LVC came back with a Brendon Irving seven yard touchdown run from the junior tailback finishing off a 58 yard drive. Finally, the defense capped the scoring with a 46 yard interception by sophomore free safety Blake Lutz. My Commentary Was: Lebanon Valley has been playing well lately and this Saturday will be no exception. They will spoil Family Weekend for the Colonels. Earlier in the year, Wilkes held off DelVal in the red zone five times in a great win, but Lebanon Valley scores 20 out of 24 times from the red paint. The Dutchman's star junior running back Brendon Irving will give Wilkes fits as he averages 136 yards rushing per game and over 6 yards per carry. This game goes to the Dutchman. I said that I liked both teams in this contest, but had to pick one. I never thought the Mustangs would shut out Widener in the first half, but they did. Stevenson pounded Widener right off the boot in the first quarter with two rushing touchdowns by Kiandre Burrell, a field goal and a passing touchdown. After the first quarter, Widener did not know what hit them and were down 24-0. During the second quarter, freshman quarterback Bradley Harmon completed his second touchdown through the air. It was a six yard reception by senior tight end Andrew Wysocki. At halftime, the Mustangs were in control with a 31-0 lead. That was unbelievable! Shock for sure in Pride land. You have to give credit to the Stevenson defense, shutting down the high powered Pride offensive unit with a goose egg at halftime. Widener tried to get back into the game with three passing touchdowns in the second half, but it was too little, too late for the Pride. My Commentary Was: I like both teams in this matchup, but I can only pick one. Stevenson is coming on this year, but has not made it to the top yet in the MAC. For me, that means I have to pick a team which has been at the top recently. That team is Widener. They have the depth to defeat the Mustangs. Wideners defense is incredible allowing teams into their 20 yard line only 12 times. They allowed only 5 touchdowns from the red zone after six games. Two of those were Albright, 2-2. This is an incredible stat and one that I believe the Pride will expand upon. Widener wins this one in a close battle! This game was very interesting for 30 minutes as Misericordia played very tough defense. And their offense scored first as senior wide receiver Tyler Rowe pulled down a 20 yd pass play from senior quarterback Jeff Puckett to go up 7-0. But King came marching back early in the second quarter with a passing touchdown of their own. The Monarchs sophomore wide receiver Marquis Miller caught a 4 yard pass from quarterback Tom Hehre tying the score at seven all. King’s went on a scoring rampage in the second half of play. Freshman running back Jordan Downes scored on a 23 yard run, Sophomore wide receiver Matt Demarco caught a 48 yard pass for a touchdown and junior running back Zack Funk ran 4 yards cap the Monarch charge. Cougars Jeff Puckett scored the final touchdown with a one yard scamper to end the game. My Commentary Was: It looks like King's will be on a two game winning streak as they will dominate Misericordia. Unfortunately, the Cougars are on a skid right now. I don't see them making waves verses the Monarchs. King's has a nice passing attack and a running game. They can finish games as they demonstrated against the Warriors last week. They took the ball with a little over three minutes remaining in the game and scored with 52 seconds to spare. Look for sophomore wide receiver Marquis Miller to continue making great catches as his hands are like glue on a football. And senior quarterback Tom Hehre has the maturity and leadership to put another on the King's side of the ledger. King's wins this one! I told you this would be a great game. I told you I could really not pick a winner. I told you that Albright would win. I was wrong!!! And here is why. It was the Aggies defense that made a difference in this battle. The DevVal D held Albright to just 99 yards rushing in the entire game. The whole Lions team could not get 100 yards rushing. And DelVal had over 200 yards rushing. So Delaware Valley controlled the game. Yes, I did make this statement, "The Aggies defense knows how to play ball. And yes I know, defenses win ball games, but Albright has such a well rounded team." Well, that theory did not hold any water here. Albright was in the red zone five times and came away with only two scores,. 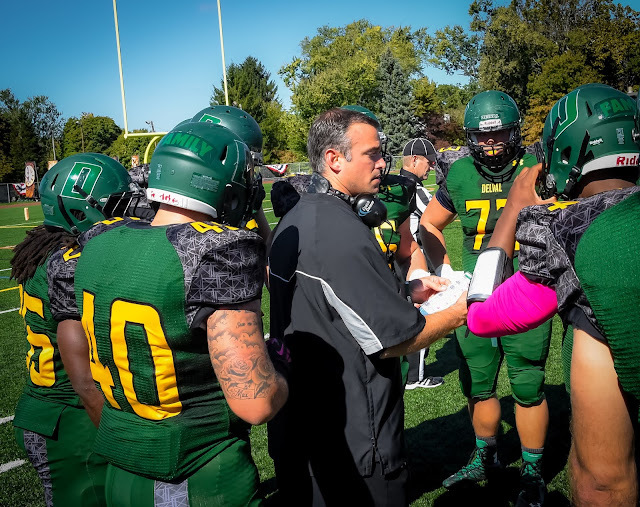 DelVal's passing defense bent but did not break. Also, I think that having two weeks to prepare for the game was a big advantage for the Aggies. Delaware Valley got on the board early with a 16 yard pass reception from freshman quarterback Dashawn Darden to junior wide receiver Michael Jensen. At the end of the first quarter junior wide receiver Tyler Bing took a ball 70 yards to pay dirt giving the Aggies a 14-0 lead. Albright would fight hard and comeback strong they did! They scored three touchdown in the second period. Sophomore running Roemello Monroe scored on a 6 yard run, junior wide receiver Malik Gilmore caught a 26 yard touchdown pass from freshman quarterback Mike Knight and junior wide receiver Gerrod Gainer caught a nine yard touchdown just before halftime. The score in this classic game at halftime favored the Lions 21-14. DelVal bounced back at the end of the 3rd quarter on a five yard touchdown run by sophomore running back Armari Fuller-Williams. Well, in this ping pong game, Albright’s field goal kicker booted the go ahead three pointer with 14 minutes left in the game. But they could not hold the Aggies as quarterback Dashawn Darden connected with Michael Jensen for the final score of the game. DelVal 24-21 over the Lions in the upset of 16th ranked Albright. My Commentary Was: This game should be a barn burner. And the barn is coming down, but who's barn will it be? So I decided to flip a coin on this one to pick a winner. And out of ten flips, five came up DelVal and five favored Albright. So I had to make a tough decision. I looked into the crystal ball and saw that a field goal would be the difference. Junior Running Back Blake Bowman scores one of his four touchdowns on the day. Lycoming might have cracked its way out of the iceberg they have been in lately. Against FDU, the offense was clicking on all cylinders and the defense stretched and did not break most of the game. The big story for the Warriors was the show put on by junior running back Blake Bowman. He did nothing other than score four touchdowns for the second week in a row. This week he had touchdown runs of 12, 23, 19 and 31 yards. He was the MAC Offensive Player of the Week, his second award this year. Sophomore running back Scott Palmer added the fifth running touchdown. 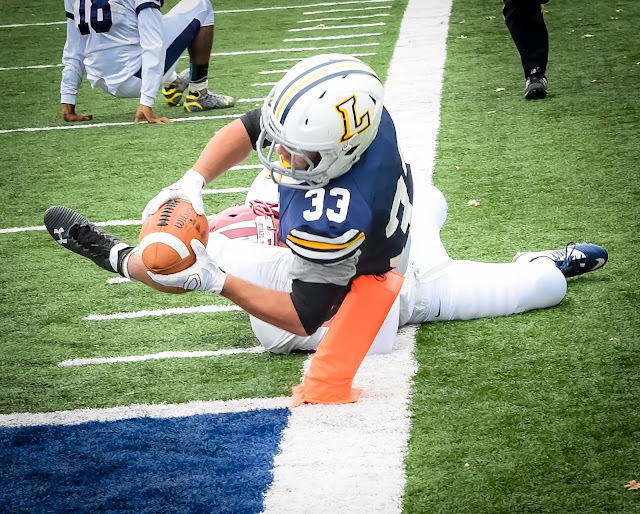 Lycoming's senior wide receiver Ryan Umpleby continued his great play with a 29 yard touchdown grab from junior quarterback Chase Whiteman. Lastly, in an unusual play, a FDU extra point was blocked by the Warriors and freshman wide receiver Mike Mulvihill picked the ball up and ran 98 yards for a big two points. FDU-Florham kept pace with Lycoming in the first quarter tying the game as sophomore wide receiver Malik Pressley scored on a one yard pass from quarterback Tyler Maurer. But Lycoming's Bowman and Palmer ran the score to 28-7 at half time. Lycoming extended the lead to 35-7 on another Blake Bowman touchdown. 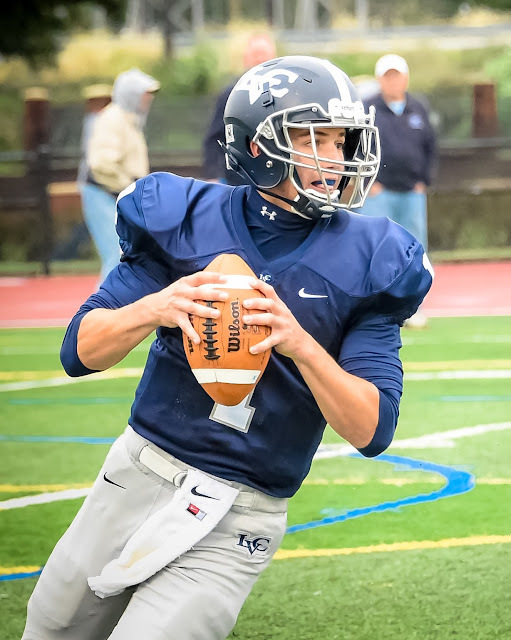 FDU came back with two more touchdowns, but it was not enough powder to shake the Warriors. My Commentary Was: This game is not as clear cut as it would appear. FDU-Florham's strength is their passing attack. Lycoming's weakness this year is their passing defense. Lycoming's defense has had trouble putting pressure on the passer and the secondary positions have been inconsistent. But I believe the Warrior running game will prevail. They have Blake Bowman, a powerful junior from Valley View, Pa. / Tri-Valley High School who scored four touchdowns against King's in a losing battle. Lycoming also struggles at the quarterback position. More inconsistent play, no continuity. Until they fix that, they will be in close games the rest of the way. For Saturday however, I just do see FDU winning this one, but they could spoil the Warrior's Homecoming Weekend. In the end, it is a Lycoming victory!